Although we at Bolt love our indie pattern labels, sometimes their packaging doesn’t do the patterns justice. The fabulous Lela is one of them. After seeing a sample made up by the designer, and how adorable it is, we decided to make one up as well so you don’t look past this beauty! 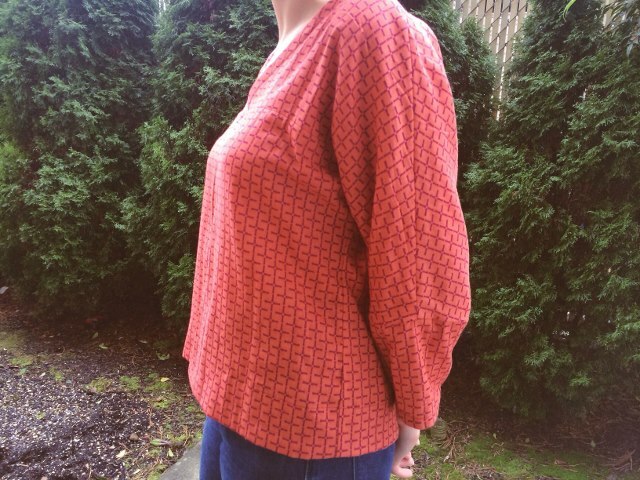 This pattern comes in two versions, the tunic, which is shown on the cover, and a blouse, which is what I made up for the shop. 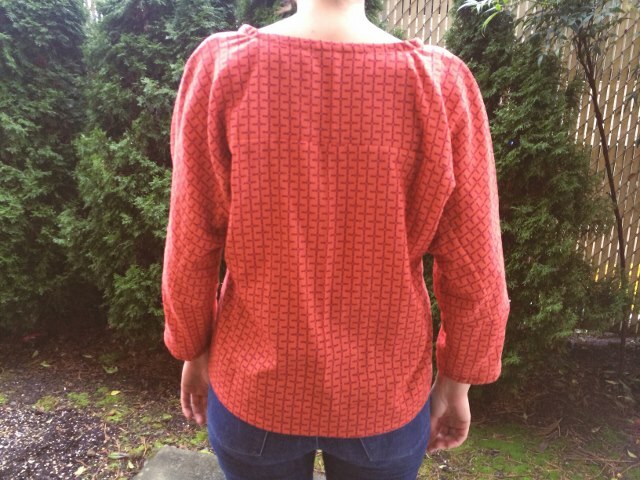 The sizing is generous, with lots of ease, so make sure to pick a nice flowy fabric for this gem. Since this pattern reminded us of classic, simple, and comfortable japanese style clothing, we thought a sample made up of Japanese imported cotton double gauze would be the perfect fit for this pattern. I can now attest that double gauze is the most comfortable form of cotton out there; at least in my opinion. After never sewing with it before, I am thoroughly hooked! It was so hard to take this sample off! Not only is double gauze incredibly easy to sew with, it breaths like a charm, and feels like a cloud on your skin. Double gauze is also very versitile. You could sew it into a long sleeve blouse for colder months, or a tank dress for summer (try it with an Alder Shirt Dress!) What I love the most about the double gauze that we carry are the colors. In the print that I made the sample out of, are two other color ways; a green and a gold. Also, are two uh-mazing nani iro metallic dots of the sweetest, light hint of lavender and grey, plus a few solids. You have to come in and check them out! Now to the great things about the pattern! This is my second Green Bee pattern that I’ve made, (the first is the Frances Shirtdress) and I must say there are some very simple tricks and sewing techniques that the designer uses. 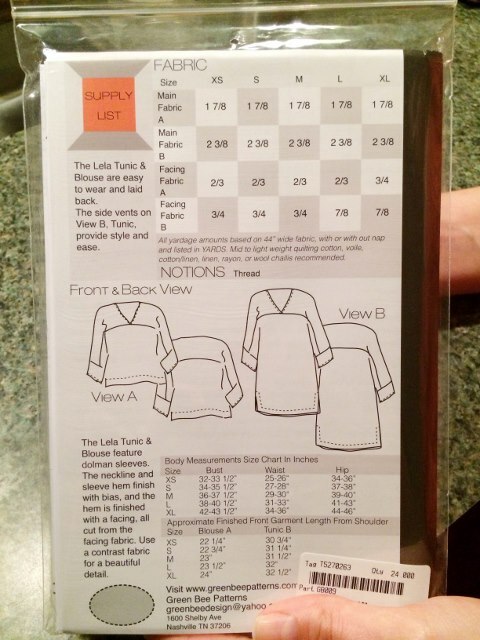 For example, instead of a traditional facing piece, you simply make a bias strip to use around the neckline, hem, and sleeve hem. The sleeve itself is rather interesting, with a semi kimono yoke, and a lower sleeve piece. The slight V-wrap neckline sure is sweet, paired with the generous ease and drape of the fabric, this pattern will have you dreaming of walking through a japanese garden and sipping calming teas. 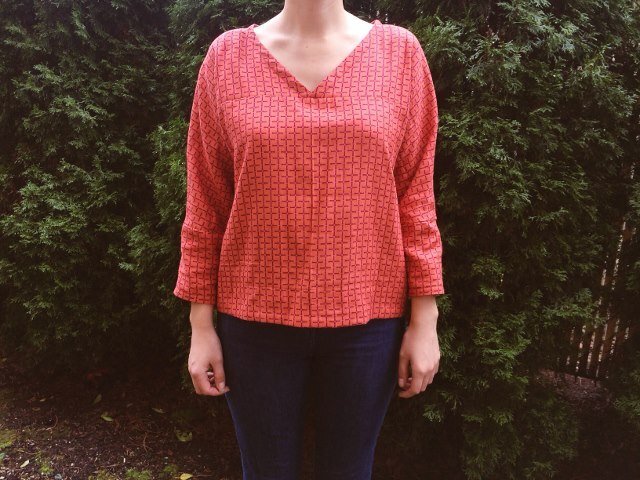 Come check out the sample in the shop and snag up a pattern! Also peruse our double gauze section:) they make for great -just about anything!